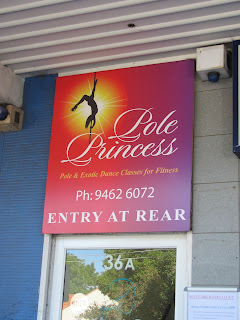 Anyone who has made their way right into the guts of this blog will know how excited I get about the Pole Princess exotic dance academy. Somehow though, their most public, and perhaps informative, piece of signage managed to escape my notice until just a couple of days ago. Happy National Water Week From the 'Voir! Happy International Lesbian Day from the 'Voir!